movie.Title = "Gone with the Wind"
A real benefit is that you didn't need to change a single line of code in the MoviesController class or in the Create.vbhtml view in order to enable this validation UI. 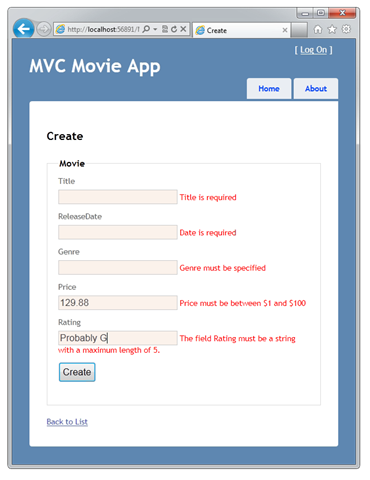 The controller and views you created earlier in this tutorial automatically picked up the validation rules that you specified using attributes on the Movie model class. 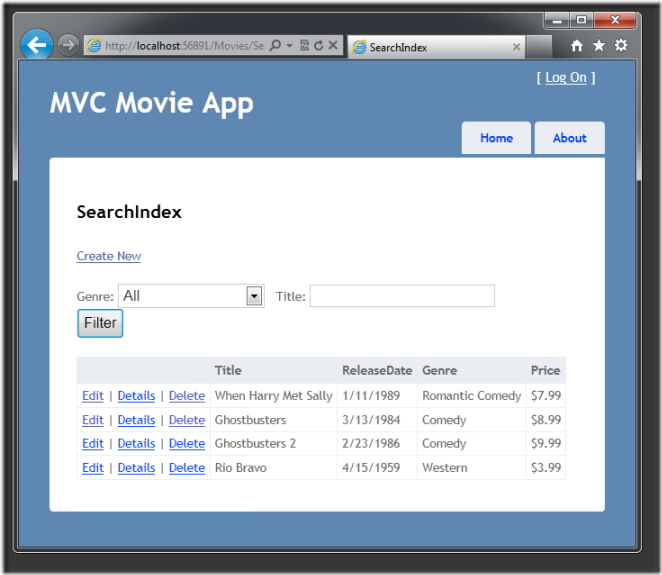 Below is the Create.vbhtml view template that you scaffolded earlier in the tutorial. It's used by the action methods shown above both to display the initial form and to redisplay it in the event of an error. Open the Movie.vb file. The System.ComponentModel.DataAnnotations namespace provides formatting attributes in addition to the built-in set of validation attributes. You'll apply the DisplayFormat attribute and a DataType enumeration value to the release date and to the price fields. The following code shows the ReleaseDate and Price properties with the appropriate DisplayFormat attribute. In the next part of the series, we'll review the application and make some improvements to the automatically generated Details and Delete methods..